ajawera: The Mystical Power of "Pis Bolong"
Browse » Home » magical , pis bolong » The Mystical Power of "Pis Bolong"
Pis bolong or Ancient Chinese Coints (kepeng money) have become money transactions tool in Bali in the past. Called Pis Bolong means money with hollows. 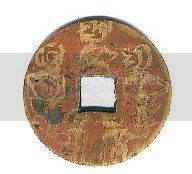 The Shape is round, flat,hollow at its center and Chinese written characters on both sides, mostly made from copper. In Bali, this "pis bolong" or kepeng money still has a function in the Balinese Hindu community. 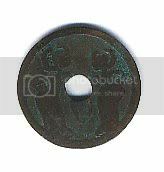 Various means of ceremonies still use it, and also used to make souvenir items for the sake of tourism. 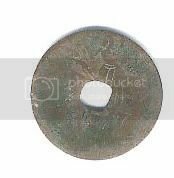 some experts in the field of archaeological objects believe that kepeng money comes from China. One of them is the opinion of the F.A. Liefrinch that mention a Chinese kepeng coins as money transaction in Bali. This opinion is based on the two surfaces of uang kepeng contains writing Chinese characters. According to the story in the past, there was a traveler from China who called Fa Hien went sailing toward the land of Hindu India and Sri Lanka. After a while there, he returned to his native country around 414 AD. But in the middle of the trip, ship was attacked and suffered storm damage. The ship was then stranded on an island which became known as Ya-wa-in. It is said that is the Ya-wa-in is Java Dwipa or Java. There is a possibility at that time kepeng money already introduced there. 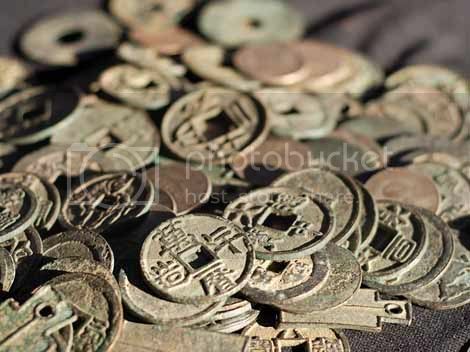 But there are experts who argue that the money kepeng known in Indonesia at the time of the kingdom in the archipelago trade relations with China. As it is known that the Chinese nation is renowned as a nation of traders since ancient times. At that time they've done trade with nations in other parts of the world, either by land or by sea. Evidence of trade relations between China with the kings of Java can be verified by the finding of money kepeng in considerable quantities in some cities such as Pati, Kudus, Batang, Kendal, Cilacap, Temanggung, Purworejo, Blora, which is geographically mostly located on the coast. 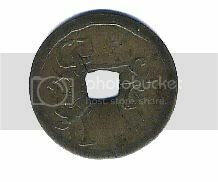 R. Gorris, a historian of the Dutch who lived in Sanglah, Denpasar, said that the money kepeng already known in Bali around 882 AD. For some Balinese Hindu society, certain types kepeng money believed to have supernatural or magical powers. According to Koentjoroningrat, the human ability to deal with this life is based on instinct and science. But sometimes it is not able to solve the problems it faces completely rational manner. For that they figure it out in irrational way , by witchcraft or magic. It is said also that the witchcraft mentioned is a human ways to influence the nature in an effort to achieve goals. The existence of such human effort that ultimately led to the things that have supernatural powers, one of which is in the form of money kepeng. Surely this kind of money kepeng has peculiarities not shared by ordinary kepeng money. 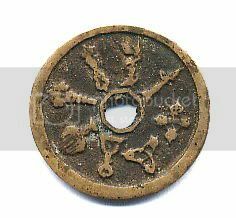 If the money used in general kepeng on two sides of Chinese writing, but the magic kepeng money on one side or rerajahan will contain a certain image of the image of Arjuna, Bhima, Krishna, Pandavas, Twalen, Sangut, Hanuman, Horse, fishnet, Crescent moon etc. 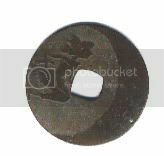 Money kepeng containing rerajahan (Balinese sacred drawing or handwriting) generally have the power in accordance with the image contained on one side of the kepeng money. His magical powers will arise if the owner or carrier of such kepeng money was sure of it. Some rumors were heard in the community that was widely magic kepeng money is very powerful. Someone who won the run race distance rumored to have kepeng money which have a picture of the horse known as Pis Jaran. A young man whose face was not so promising was suddenly married to a girl as beautiful as an angel, then was rumored to have Pis Rejuna. Balinese believes some of the kepeng money has a magical powers for the owner. But not all kepeng money have a magical powers only kepeng money with some sacred drawing. To change the ordinary kepeng money into magical some ritual must held. The Ritual calls pasupati or inisiate the ordinary kepeng money with spiritual powers with some offerings and Balinese priest/shaman (balian or mangku). 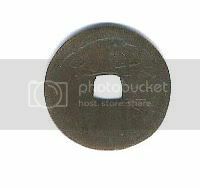 Bellow is some examples the magical kepeng money with each spiritual function. Pis Sangut and Pis Delem? This is in great demand by many people because they have magical powers as Sangut figures in wayang stories. With a Pis Sangut then people will become very good at arguing. Similarly, pis Twalen also believed to have supernatural powers. It is believed that by bringing this Pis Twalen/Malen people will feel calm when confronted with any situation. He will be respected by his enemies, and able to influence the thoughts and opinions of others. Pis Rejuna With Angel(Dedari); makes the owner idolized by girls; the owner looks like Arjuna/rejuna the most handsome character in Pandawa. Then, Pis Kresna, according to Kresna's role in the puppet world, then the function is as a guide to the direction of virtue and wisdom. It is believed also that the people who make a fetish pis Kresna will have noble qualities such as always sided with the truth, honest, and always uphold justice. Therefore it is very suitable objects owned by a state leader. Pis Nawa Sanga: Nawa Sanga is like an compass for Balinese peole. Nawa Sanga which means nine direction of winds; will prevents the owner from evil spirits, bring good luks, remove all obstacles. Pis Pandawa, so called, because on the surface there is a picture of trep fifth son of Pandu Knight according to Mahabratha Story representing the protagonists character , namely: Dharmawangsa, Bima, Arjuna, Nakula and Sahadewa. 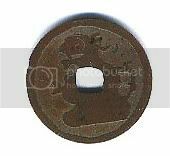 This talisman believed to have supernatural powers such as dignity, strength, and wisdom. Pis Delem: delem is one of servant from the antagonist character in pewayangan(Balinese Puppet show); with this talisman the owner will have confidence in debates. Pis Rejuna, according to the epithet, then on one side was a picture of Arjuna/Rejuna. In the story of the Mahabharata, Arjuna is known as the third son of Dewi Kunti, and number three of the Pandawa. In addition to good archery, he was also known as a valiant knight. Her face is beautiful cause she idolized by many women. That's the real beauty of the cause then way many men willing to have the Pis Rejuna . In addition, there are some people who believe that by making a fetish pis Rejuna will cause a lot of women crazy to the owner. But there is another opinion says that Pis Rejuna function is to maintain the relationship of a husband-wife or the couple's relationship romance. Pis Nakula-Sadewa; Nakula-Sadewa is the famous twins of Pandawa, this talisman brings you good luck, maintain relationship among your friend, relatives. Pis Bolong Siwa; Bathara Siwa is the highest Gods in Balinese Hindu religion, This Talisman will brings high spiritual power to the owner, prevents form evil spirits. Pis Bolong Dewi Kunti: Kunti is the mother of Pandawa, this talisman brings wisdom as a mother to her son/daughter; to maintain inner beauty of women. This is Pis Bulan/Dewi Ratih, according to sources this Pis Bulan have magical powers to women or mothers, for increasing the inner beauty of women. Pis Bima has supernatural powers which in essence upholding honesty and truth. Therefore, very suitable pis Bima owned by people who assumed duties as Pecalang(Balinese community Security). In addition, for those who make a fetish pis Bima will make him agile and skilled in war. Similarly, pis Anoman (Hanuman, The powerful white-monkey in Ramayana Story), The speciality is able to provide the strength and energy like wind to the person who brought them. 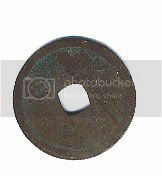 The picture above are example of Genuine Pis Bolong which obtained by High Spiritual Force by someone which chosen (Kapaica). And in fact there are many more types of Pis Bolong or rerajahan kepeng money circulating in communities with limited or symbolic images. 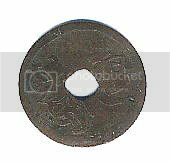 However, it should be understood that this type of pis bolong there are also lots of copy, which this certainly does not have supernatural powers and what its role is limited as a mere accessory items. Would you explain about Pis Bolong Kecubung Sari? The size is slightly bigger than others pis bolong. What is the magical power of it? Thanks!